Five members of Hinckley & Rugby Building Society staff have amassed 25 years of helping pupils at Manorfield Primary school in Stoney Stanton with learning maths. The five – Sam Roberts, Jaime Taylor, Stewart Heeley, Carla Loughrey and Evan Crosskey – have each been recognised for five years of weekly volunteering with the children, playing maths games with them to help build skills and confidence. 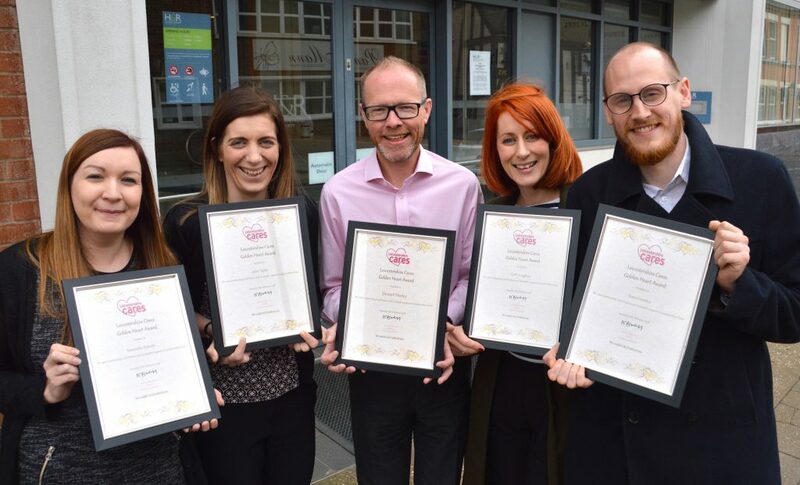 The Number Partners project is run by the business and volunteering charity Leicestershire Cares, which presented the five with Golden Heart certificates to mark their long service. “We can’t quite believe it’s been five years but when you look back at all the children we’ve worked with it feels a great achievement.